What is the Difference Between 720p and 1080p HDTV? "I'm buying a new HDTV. I looked at 720p and 1080p HDTV screens. Both 720p and 1080p look great in the store, but the 1080p HDTV I'm looking at costs more than the 720p HDTV. What is the difference between 720p and 1080p HDTV if both look great?" You hit on an important point in your HDTV shopping research. The actual technology differences between 720p and 1080p HDTV may not matter as long as you buy an HDTV that looks good to you and keeps you satisfied for the life of your purchase. For many viewing scenarios, the difference between 720p and 1080p is fairly minimal. I'm a big fan of buying the best product you can afford, but here are some things to keep in mind as you narrow your HDTV purchase options. The primary difference between 720p and 1080p HDTV screens is resolution. A 720p HDTV displays video at a resolution of 1280x720. A 1080p HDTV displays video at a resolution of 1920x1080. What this means is there's potential for considerably more detail in the 1920x1080 video (assuming the content source you are watching delivers that level of detail). 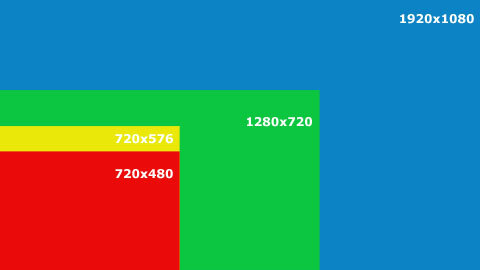 You can see just how much more picture data is present in a 1920x1080 video source in the graphic below. The key point above is not all content sources are available at resolutions directly matching the HDTV you choose. Many high definition cable channels are still broadcasting 1280x720 video that is then displayed at 1920x1080 when shown on a 1080p HDTV. Depending on how well the HDTV you choose does upconversion of video, those cable channels may look quite a bit worse than they do on a 720p HDTV. Another place where you should keep an eye out for differences between 1080p and 720p is playing DVD content. All the DVDs released before Blu-ray became popular are typically 480p content, which means every HDTV will upconvert the DVD content to play it full screen. In many cases, DVD content played on a 720p HDTV will look better than the same content displayed on a 1080p HDTV because there is less difference in going from 480p to 720p than going from 480p to 1080p. Blu-ray is where 1080p really shines at the moment. Most of the newer movies released on Blu-ray are made for 1920x1080 display, which means watching them on a 1080p display is the native way to watch the Blu-ray video. The other thing to keep in mind when choosing an HDTV is the refresh rate. You may notice that HDTV features frequently list 120HZ or 240HZ as a feature. This is how frequently the screen refreshes, which translates to a smooth picture on higher motion content. If you primarily watch talking head content like new programs or dramatic shows with lots of dialog and minimal motion, the refresh rate may not matter much. If you watch high motion content like sports and high action movies, a higher refresh rate will translate to a smooth viewing experience regardless of whether the screen is 720p or 1080p.